What a day!! The mood went from optimistic, to excited, to frustrated, to really frustrated, and then to maximum adrenaline! There were two plays for the day, the warm front around the northeast Kansas / northwest Missouri border, and the dry line in west central Kansas. The dry line play was the riskier because of the strong cap, but had the better ingredients for isolated, rotating supercells if the cap did indeed break. We started the day in Kearney, NE and headed down to Hays, KS where we stopped for lunch. We then drifted down to La Crosse and parked for about 2 hours at the Barbed Wire Museum / Park and waited, with the triple point just to our west. After relaxing for a couple of hours, we began to see agitated cumulus clouds to our west, and headed about a mile west out of town on a county road for a better view. We watched as several towers tried to go up on the triple point, hit the cap, sheared over and died, then kaboom!, one of them finally broke through and the chase was on. We blasted towards Liebenthal, KS and in just minutes the storm had developed a fantastic base with an inflow band flowing into the storm from both the front and rear flanks of the storm. We ended up just on the north side of the base with the precipitation core to our northeast and the base, which was already developing a lowering, just to our south. The storm quickly developed into one of the dirtiest I've chased, blowing out an enormous RFD plume which got entrained in the updraft, resulting in flying dirt everywhere. It was around this time that a tornado was reported right on the front edge of the storm, with a big dust-bob and perhaps a nub funnel coming in from the base. This was recorded officially by NWS as a tornado, and some of my stills have me mostly convinced, so this was tornado #1 for the tour. The area of rotation rushed toward us, and we ended up driving right through it as it crossed the Munjor road as we paralleled I-70 West-East. I think I still had grit in my teeth that evening from all the dirt that was flying around!! Along with a boatload of other chasers we chased the storm as far as Russell, watching it struggle to stay organized. Finally, as the storm looked progressively worse, our attention was drawn to the tail end of the 3 storm grouping that had developed along the front from the triple point, and we calculated that we could get there before dark so we blasted south on Rt. 281 to Rt. 4, then west back towards La Crosse. As we passed the middle storm, it developed a nice looking wall cloud and we became really torn about sticking with the middle storm or continuing to our target tail-end storm. But we grudgingly continued towards the tail-end storm, which was just coming into view and was still tornado warned, though we could not see the base through the front flank core. Here was a case where the fact that we blew off the northern storm earlier than most, which would normally be a good thing, actually ended up as a point of frustration: As we finally got to the tail end storm, the base looked horrible, and then the middle storm started dropping tornadoes!! Everyone who'd left the lead storm late was conveniently right in the slot of that storm and got to see the tornadoes from that storm (though in hindsight, aside from a neat looking ropeout from one of them, the tornadoes were nothing exciting, and certainly nothing compared to what we were about to see). Meanwhile, we were in La Crosse completely flummoxed about what to do! Do we head back to the middle storm that we knew was tornadic, hoping to catch a glimpse just before dark, or stay with the tail end storm, which was the true triple point storm and on radar had clearly wrapped the boundary into it and thus should have the best conditions for tornadoes? It looked horrible visually though, so we decided to charge right back to Rt. 281 and try to get to the middle storm that we'd just driven by! As it happened before we got back into La Crosse, someone looked out the back window and alerted me that the lowering on the tail end storm was looking better and we stopped again, conferred for a minute and decided that we needed to stay with our tail end storm. We drove back west of town and found a place to stop, ironically only about a mile north of where we watched the first storm forming on the triple point several hours earlier. Soon we were rewarded with a spectacular structure show, as the updraft became incredibly striated with inflow stingers entering the storm from 3-4 different locations and a beefy block-wall cloud spinning like crazy heading directly at us. The storm was highly electrified and we had CG's hitting all around us, so we kept the guests in the van for the most part until the front flank core got a little farther away. The bolts were of the positive variety, meaning that there were no branches in the bolts and the thunder was not the cracking variety you usually here but instead there was just the single BOOM as each bolt hit. The storm looked like it would tornado any second as it got darker and darker and we waited.....and waited.....and waited.... 15-20 minutes as we got more and more frustrated until finally, at about 9:20 PM a big cone tornado developed and quickly had a large debris fan around it as it closed in and crossed Rt. 4 to our west only about a mile away! We were in great position to watch for about 10-15 minutes as the tornado approached our location but eventually we started getting hailed on and retreated towards the town. We stopped again and continued to watch as the tornado morphed into a tall stovepipe, again with a big debris fan. The town sheriff came over and made us move (no question emergency officials were more sensitive this year) so we quickly complied and got right to the edge of town and stopped, then decided to move to the north side of town and watch the tornado pass to the north of town. It didn't take long before the tornado was right back into view, a tall, almost Campo looking tornado, still with a large debris fan, continuously illuminated by the copious amount of lightning that was banging away. The tornado sirens were screaming as the long stovepipe passed just north of town and we got run over by the rear flank downdraft of the storm as the tornado got just to our north. Then the rain cleared out and we were able to leisurely watch the awesome tornado to the north, then northeast before it finally roped out. A check of the time between my first Facebook post and my last when it roped out: The tornado was on the ground for 54 minutes! Easily the longest I've seen. A nice reward for the 60th tornado I've observed overall! The fun was not entirely over for us though; as we found out that the road north out of town was blocked by downed power lines, so we had to find another way out to get north to our hotel way up in North Platte, NE. We found that the road south into town was also closed (we found out later that the south side of town was hit by a second tornado), so we headed east out of town towards Bison. Only a mile out of La Crosse we caught back up to the storm and another big stovepipe had formed, looking much like the last! We watched that one for few moments as it drifted off slowly northeast peaking in and out of the rain before we headed west through town, past the point where we originally saw the tornado touch down and then north to Wakeeney and through to I-80 in Nebraska to North Platte. A great chase day! When we stopped at the tail end storm and saw how bad it looked and how the middle storm was now producing, it was the height of frustration, only to end up seeing the best night time tornado I've seen, along with two others. Although it seemed like we drove forever, the mileage total for the day was "only" 553.8 miles. Click Here to see the video of the La Crosse Tornado. Here is a map of the damage path. The 2 "x's" mark the locations from which we observed the main tornado. 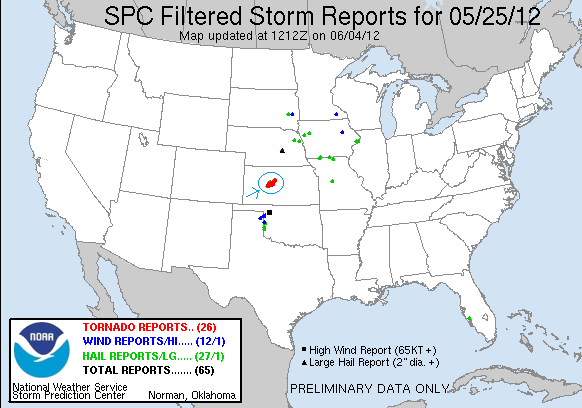 Note that there was a brief EF1 tornado that went right through town to our south, doing some significant damage. We never even knew that one was there! After a long wait, the triple point starts to percolate just to our west. Watching storms start to develop on a county road just west of town. Finally the cap breaks! In no time we have a developing supercell on our hands as we follow the storm north of town. Nice wall cloud developing and you can see the anvil above. Zooming right under the updraft. The lowering quickly developed into a "moustache" cloud, sucking in inflow from both front and back. Awesome structure once we got out ahead of the storm! Here comes the mother ship! This is a spotter reported tornado. We debated a long time about whether to count it or not but since NWS did, so did we. Hard to tell with all of the RFD dirt entrained in the updraft. The RFD gets out of hand. Dirt bath anyone? We plowed right through the rotation near Munjor. If it ever was tornadic, was not very strong. That's right, we DOMINATED it! Now near Russell, Kansas, a raggedy wall cloud, but the storm seemed to be losing organization. Having blown off the lead storm to go for the tail end storm about an hour away, we passed another storm in the middle with a well defined wall cloud. It eventually produced several small tornadoes. We headed back through La Crosse and stopped just west of town close to the rapidly rotating wall cloud. Ironically, we stopped only about a mile from where we'd waited for storms to form out on the county road just south of here almost 5 hours, and 150 miles of driving, earlier! The wall cloud just over the road about a mile from us. The motion on the right side of the wall cloud was amazing, as was the lightning! After waiting seemingly forever and after one failed attempt at a tornado, the storm finally produces right at dusk! Tornado finally touches down! Nice cone tornado along Route 4 about 7 miles west of town. Tornado gets stronger and debris fan develops. At this point it was dark so all of the following pictures are illuminated by lightning. Luckily for us, the storm was VERY electrified so it was possible to see the tornado often. Power flash as the tornado takes down some power lines. Lightning illuminates what is now a BIG cone crossing route 4. A little later we repositioned just to the north of the town. The tornado, now a long stovepipe, crosses Route 183 just north of us. Visible only by lightning and with the tornado sirens blazing, it was pretty spooky out there! Lightning illuminates the tall stovepipe and it's big debris fan. Better view. By now the tornado had eroded the entire wall cloud and extended all the way up to the updraft base. This has to have been the tallest tornado I've seen. Lightning illuminates the debris fan. The tornado begins to rope out, illuminated by a cloud to ground bolt in the background. The bolt and tornado are almost symmetrical. Ropeout in progress. Look how TALL this tornado is! The tornado was on the ground for 54 minutes, by far the longest duration tornado I've witnessed. Over that time it traveled only about 10 miles. The last gasp of the La Crosse tornado.